Krea is the ideal solution for small/medium hotels, reception areas and locations where quality coffee, reliability and contemporary design are paramount. Benefitting from Necta’s latest espresso brewing and instant freemix technology you can expect the best quality drinks all day long. 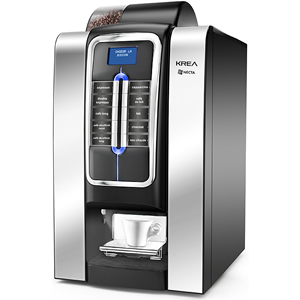 Krea is a high volume Bean to Cup machine capable of producing circa 300 drinks per day. 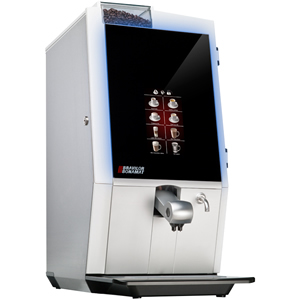 It is a push button machine that provides the user with 10 drink options and/or the option to include additional de-caff and go large pre-selects. 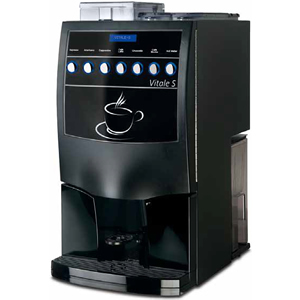 It’s capacity and functionality make this the ideal machine for large offices, hotels and leisure facilities. It’s art-deco design give it the edge over like for like machines as it is remarkably quiet considering the size of the brewing capacity. The Krea can come with additional coin mechanism and uses Lavazza coffee products to provide premium quality espresso based drinks. It is LED lit interface and cup station area as well as large graphic display 128 x 64 pixel with possibility to show simple animations.